Preheat oven to 450° F. Bake time: 8 – 10 minutes Place crust directly on center rack and bake until slightly crisp, about 6 minutes. Remove crust from oven and let cool. In a medium bowl, beat together the cream cheese, confectioners' sugar and vanilla until fluffy. Spread the cream cheese mixture over the cooled crust. Top with sliced strawberries and kiwi, placed around the edge of the crust and slightly overlapping. Fill in the center with strawberries and kiwi. 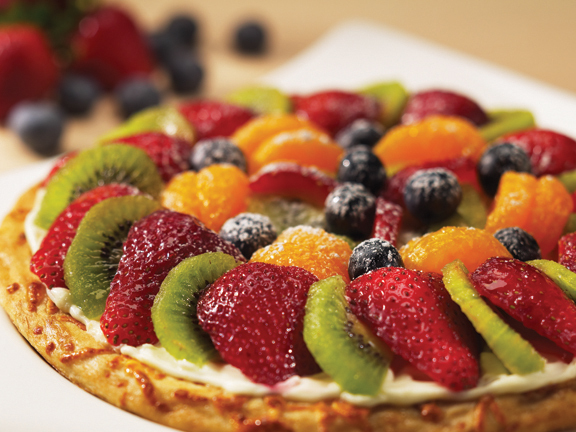 Arrange Mandarin orange slices in a circle around the center of the tart. Add blueberries and then lightly dust with confectioners' sugar. Chill 15 minutes, then slice and serve.